The power behind goal setting cannot be ignored. Sporting greats, the athletes among us that have clear, well defined written goals enjoy success the dreamers can only imagine. An action plan can be built, a blueprint for success mapped out, only when we know what we are aiming at. Its a chore that we are happy and willing to help you with. Imagine a turnkey system, an approach that will have your sports club moving in the right direction. We exist to help grow your club! Imagine a turnkey operation. A system in place where the organisation moves towards the desired goal as a team! We can help you merge your clubs goals, into an actionable plan. Together we can create a system for success, that may be easily followed and monitored to make and keep your club great. We help you merge these two systems together, into an actionable plan. What Is Strategic Sport Club Planning And Why Do It? 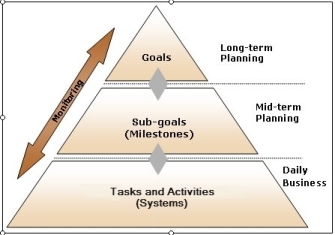 Strategic Sports planning is the long range planning approach. It is used to create a vision (goals) of the organisation on paper, to ensure all involved know what they are working towards, and focus their energy and efforts in the same direction. With the vision in place, together we can create sub-goals or milestones the team can work towards. This is where the real strategic approach comes into play. We can monitor our progression towards the goals using key point indicators to determine where the club is at any point in time. This information is essential in making the correct adjustments required to meet the goals set out. Key Point Indicators = GPS for your organisation. Its all about knowing the vision, and breaking them down into bite size manageable pieces. Who will be responsible for taking the actions. We offer specialized planing services to help Qld sporting organisations to develop Business plans, Strategic Plans and operational plans to improve the clubs performance. It doesn't have to be complicated or overwhelming. Your club can benefit from a wide variety of services we offer in relation to planing. We take the guess work out, ensuring your have all your bases covered, and most of all, the process is simple when you have a company like ours working for you to make your planing easy and effortless. The process starts with opening the lines of communication between ourselves and the relevant person in your sports organisation to determine your planning requirements, and decide how we can meet your needs. Through this we may gain an understanding of how your particular sports club operates. Then through collaboration with your staff and our team, we work to produce a highly professional strategic, business, marketing or process plans. This becomes your clubs living document, your blueprint for success, that you can refer anytime, to ensure you are on track, heading in the right direction and that all involved understand the vision of the organisation clearly. We gather information about the sports club and the people behind it. Getting to know how your club currently operates, its short and long term goals. We look at current plans, operation procedures, policies and more. Here we work with you to focus on making these goals clear and creating an action plan tailored to your club, for easy execution. We cover all the basis, in an easy step by step process. This plan is not just a set and forget action. It is a living and breathing document and process. We will equip you with the tools to monitor your clubs process, and will keep you in the loop with all developments in your field, as well as following up and monitoring your progress to help keep you on track. Having plans like this in place, not only helps streamline the daily operations of the Club, to meet the long term goals, but they provide a framework, with easy to call documentation that is often required when applying for government funding and private grants.